Law enforcement officers in Western Kentucky stopped a vehicle for an infraction that led to some seriously interesting collectible guns and possible federal weapons charges. 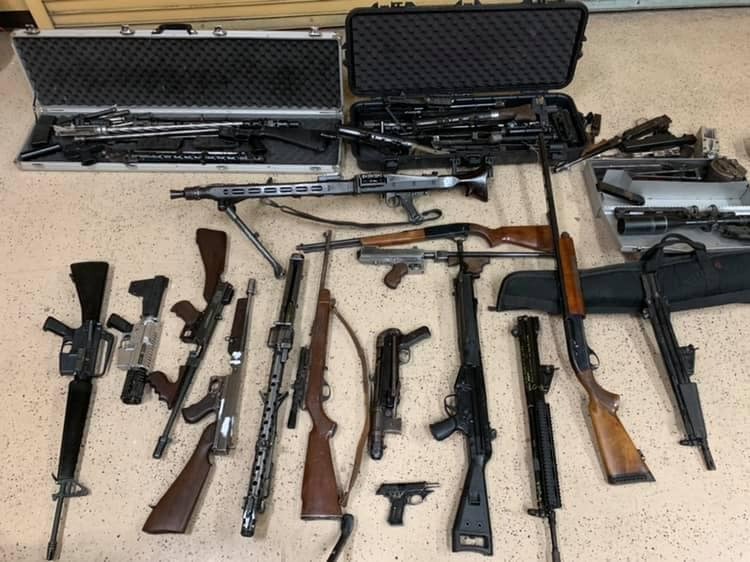 A search of the driver’s home produced more firearms and ammunition including another eight weapons listed by authorities as being fully-auto. The photos show what appears to be a number of German WWII-pattern machine guns to include an MG34 and a pair of MG42s as well as parts for others. Besides these early roller-locked LMG/GPMGs, there are HK-pattern MP5 parts, several Thompson submachine guns in both M1928 and M1 variants, and an MP40 sub Slickgun that looks to have had its barrel amputated. Of course, the images are not very high resolution and lots of the items look questionable, which could point to anything from airsoft to surplus torched parts kits knitted back together to form display guns common in reenactor circles or non-NFA semi-autos, so there’s that. Mixed in the set are such innocuous classics as a Remington Speedmaster for when you want to get some tin can plinking in. Many posters urged authorities to preserve the guns should they, in fact, prove to be historic, by placing them with a museum, rather than to destroy them. Others interjected that the weapons were possibly war trophies brought by to the country by returning GIs after WWII or part of a stolen high-value collection. For example, transferrable MG34s can run in excess of $25,000. The suspect, who is not identified, was charged with improper equipment, drug trafficking, and carrying a concealed weapon. Federal firearms regulators are involved in the case and reportedly have more weapons charges pending. The post Traffic stop leads to collection of rare full-autos in Kentucky town appeared first on Guns.com.